What Is The Best Handheld Vacuum? Are you fed up of dragging a heavy and bulky vacuum cleaner around when you want to clean an area in your home? Do you want a more convenient, easier and quicker way of getting the job done? A handheld vacuum cleaner is what you need. It provides you with the convenience of portability, which allows you to clean any place you want, whether it’s your home, your car or your office. And with the many accessories that often come with a handheld vacuum, you can reach the most awkward places and make the most difficult jobs much easier to hoover. Not to mention that it’s is light, compact and sometimes cordless. But with the different product models available, all vying for your attention, it makes it hard to know what the best handheld vacuum is. You need to take into consideration the hose length, whether you prefer corded or cordless, waste capacity and the accessories you need, among a few other factors. This website (www.besthandheldvacuums.com) is dedicated to providing you the right information so that you can easily choose the most suitable handheld vacuum cleaner for your ultimate purpose. If you want to learn more about vacuum cleaners in general (there’s a brief section about handheld vacuums), then I recommend the in-depth Vacuum Cleaner article on Wikipedia. We have drawn up several very useful comparison charts in each category to help you compare products, pricing and features, so that it’s easier for you to make a decision. Our Final Verdict: This is based on our research and testing. Cordless: Is the device corded or cordless? Battery Indicator: Does it have a light indicator to tell you when the battery is low? Charge Time: If cordless, how long does it take for a full charge? Run Time (minutes): If cordless, how long does the battery lasts for after a full charge? Washable Filter: Can the filter be removed and washed? Dirt Capacity: How much waste can it take until the container has to be emptied? Bagless: Does the device use a bag to contain dirt and dust or not? Accessories / Attachments: What accessories does the product come with? Dimensions (inches): What is the size of the product? Weight (pounds): How much does the product weigh? Price: Based on Amazon’s marketplace. Please note that pricing changes occasionally due to promotions and discounts. Warranty: How long is the warranty period? Our comparison charts features just some of the most top rated handheld vacuums and our best picks, but Amazon provides a much wider range of models. You may also want to check out what the best selling handheld vacuum cleaners are on Amazon so you have a good idea what people are buying and why. Purposes: What are the purposes that you’re going to be using it for? Will you be using it to vacuum your car? 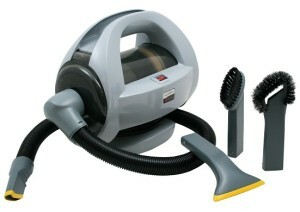 Or do you need one that is more suitable for cleaning pet hair? You need to be sure of these factors because there are certain models that are catered towards these specific purposes. Corded Or Cordless: This is one of the main questions people ask themselves when shopping for a handheld vacuum. A corded model means that you won’t have to worry about charging it, but is less transportable, while cordless can be carried around and used literally anywhere, but you have to always charge it up beforehand and battery life can vary dramatically from model to model. Dirt Capacity: Handheld vacuums have a small dirt capacity container than upright vacuums, so you may want to find a model that holds more than others if you clean often or if you have pets who shed hair a lot. Running Time: Cordless models only have a running time of between 5-30 minutes after a full charge. If you don’t think that this is sufficient enough time to get your cleaning done, then you should opt for a corded model instead. Recharging Time: If you plan on buying and using a cordless handheld vacuum often, then ideally, you’d want one that can be charged fairly quickly. It can take anywhere between 3-24 hours to fully charge the unit. To understand more about battery capabilities and recharging times, I suggest that you read the excellent Rechargeable Battery article on Wikipedia. Hose Or No Hose: Do you require a hose option? Some handheld vacuums will include a stretch hose to reach more difficult areas, but they are often bulkier and heavier than those without a hose. Ease Of Cleaning: Aside from having a large dirt container that doesn’t need to be cleaned as often, you may want a clear container so you can see the contents. Also, you’d want one that can easily be detached from its base so that it’s easier to empty waste. 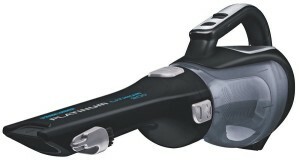 Accessories: Nearly all handheld vacuum cleaners have accessories included, usually a brush and/or crevice tool. Other (often more expensive) models have even more tools such as long or narrow crevice and pet hair tool attachments. Will these tools come in handy for you? Dimensions: Portability is important, but some models are bulkier than others, but often have more features. Are you willing to sacrifice a more compact size for more features? Weight: This usually relates to the size of the vacuum, although not always the case, depending on the design and battery size. If you have wrist or hand problems, then getting a lighter device would be more suitable for you. Warranty: All products should come with a standard one-year guarantee, but certain models and brands offer an extended warranty as standard, which means that they have faith behind the quality of their product, giving you added peace of mind also. For a more in-depth guide, read our Definitive Guide On How To Choose A Handheld Vacuum Cleaner. I found a really interesting and useful video on 3 handheld vacuums that were put to a lab test. Although it’s several years old, there are some good points about certain features that still hold true to this day. We review many different types of handheld vacuums, but certain ones stand out more than others in their respective fields. Here are 3 of our best choices in each field, in no particular order. 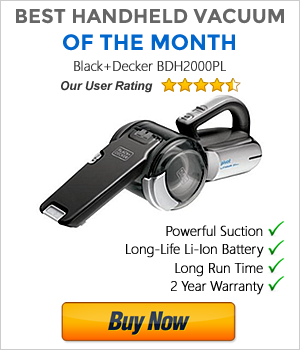 The Platinum BDH2000L Cordless by Black & Decker features a slim rotating nozzle with a slide-out crevice tool on the end, which allows you to reach into tight spaces and hard-to-reach areas. We find the stylish black on silver design is attractive and perfectly matches its name and technical features. It’s an excellent handheld vacuum for picking up various sized dirt and debris with its wide mouth nozzle. However, the real highlight of this neat device is powered by a 20-Volt Max Lithium Ion battery that sees no loss of memory, can hold its charge for up to 18 months, and as a result, the lifespan of the battery is also increased. 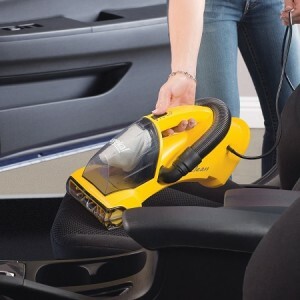 If you’re looking for a handheld vacuum that will do a fine cleaning job for your car interior, then the Carrand 94005AS Auto-Vac should be the leading candidate. It’s a powerful vacuum with 550 watts of cleaning power and a host of tools to ensure you are able to clean every bit of your car – 40’ flexible hose that can be rotated 360 degrees from the elbow, a dash and console brush, crevice tool and an upholstery tool. All of which can be stored on-board neatly so you don’t accidentally misplace anything. 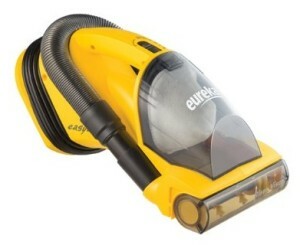 It may look simple and basic, but looks are deceiving in this case because the Eureka EasyClean 71B actually has a wide variety of features and can do many cleaning tasks effectively. When it comes to cleaning carpeted stairs or the back of furniture, it’s easy work. The Riser Visor is a clever mechanism in the form of a plastic cover that stays down when cleaning horizontal surfaces, but flips up to allow the revolving brush to clean vertical surfaces. The fact that it’s powered by AC and has two motors, one for the revolving brush and the other for suction, makes it a powerful little handheld vacuum. Its portability, 20 foot cord, hose and crevice tool also allows it to be taken around the home easily and also ideal for cleaning your car. If you want to read more reviews by us, you can visit our Reviews section, where we review the best handheld vacuums based on user experiences, ratings, features and price. What Is The Best Handheld Vacuum For Pet Hair? What Is The Best Handheld Vacuum For A Car? © 2018 . All Rights Reserved. Created using PressWork.